We're fairly familiar with Pendleton and their traditional men's fieldwear that has been making the rounds with downtown hipsters everywhere but we had never taken the time to explore their latest offerings including their diverse home accessories line. 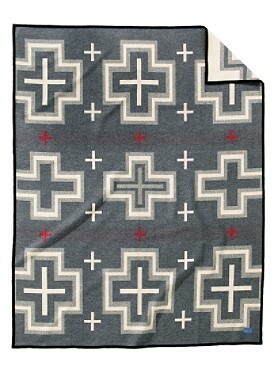 The one item that caught our attention right away was the San Miguel blanket which has a "pattern inspired by mid-to-late 19th-century Native American weaving traditions and the influence of Spanish missionaries in the Southwest.". We actually felt that it had an almost Danish feel with influences rooted in Modernism which we suppose goes to show you that good design can be many things to many people. Check out the blanket collection on their website but make sure to peruse their Ranch Style section for great wrap shawls and field shirts.